Why has it become customary to view affairs only from the lens of Christian West nations and through their communication channels? If the world can ask ‘why is the world ignoring Myanmar’s Rohingyas’ why can’t the world ask ‘what are the fears of the Buddhists of Burma?”. When the world does not ask this all important question but goes on an international campaign to denigrate the Buddhists of Burma it has to be with sinister intentions which have nothing to do with Rohingyas. The Theravada Buddhist countries of Thailand, Myanmar and now Sri Lanka are under attack in various ways by essentially the same people using Christianity and Islam as tools. It is for the Buddhist world and Asia to congregate and protect each nation. World history has never been kind to Buddhists or seen issues from the lens of Buddhists. Therefore, it is left for the Buddhists to take the truth to them. Firstly, mainstream news omits an important point in discussing the issue of Rohingyas. There were no such people called ‘Rohingya’ before 1948 or even as far back as 1824 when the British conducted a census. 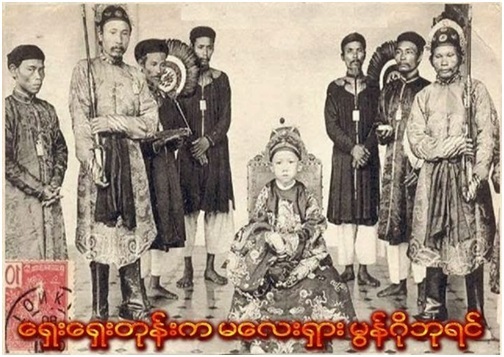 Muslims were brought into Myanmar by the British. They are thus not indigenous to Myanmar. They have been streaming from neighboring Bangladesh. Rohingyas speak Bengali and do not know Burmese. They cook and live like Bengalis. Why should illegal immigrants be made legitimate immigrants? It is believed there are 800,000 Rohingya Muslims in Rakhine or Arakan state, an area which is bountiful in natural resources and oil and thus the real reason for globalists to use ‘Rohingyas’ as an excuse to push the Human Rights theme and enter Mynamar. If British introduced Muslims to Myanmar with the intent on creating future trouble that objective has come true. The British armed Muslim in North Arakan to create a buffer zone against Japanese invasion in World War 2 and promised the Muslims their own ‘national area’ within Burma. It is this promise that the Muslims are now asking or the British are now manipulating the ‘Rohingyas’ through their agents the Islamic militants of subdivisions of the Al Qaeda. While Muslims and mainstream media like to project a version of Muslims as being the victim, it was the armed Muslims that began a wave of violence against Buddhists in the Arakan region destroying Buddhist villages. Why does the media refuse to highlight the violence started by the Muslims who were armed by the British against the Buddhists as far back as 1942? Where were the cries for the 20,000 Arakanese Buddhists slaughtered by these Muslims? Why is it always the retaliatory attacks that get coverage and not the actions that caused the retaliations? While the world enjoys projecting Buddhists as ‘terrorists’ they have unfairly omitted to mention the manner that Western-backed Mujahideen movements were very much arming the Muslims from 1947 to 1961 in a bid to separate northern part of Arakan and annex it to the newly formed Muslim East Pakistan as an exclusive Muslim country where globalists could easily use Wahhabi influence to make geopolitical expansions while keep the country in total disarray. The Muslim violence throughout the world are all controlled and orchestrated by Western imperialists and they are continuing to do the same throughout the world and Muslims in view of their subservience to the will of God and Islam are easy prey. The British know this only too well and they have mastered the art of manipulating this weakness in Muslims. What needs to be repeatedly mentioned is that the Rohingyas as no innocent victims. They are led by armed militants and Burma has every right to establish the Burmese Citizenship Law and deny Rohingyas Burmese citizenship. Rohingyas that are armed possessing machine guns, assault rifles, rocket launchers, claymore mines and explosives are no innocent party. If they are armed the question is where are the arms coming from and how are they paying for these sophisticated weaponry. If they are being trained, who is training them and why? If Rohingyas are having connections with Al Qaeda why is the West continuing to take the side of the Rohingyas unless these connections have bigger connotations! In the light of these external connections and involvements of political, militant and terrorist kinds should the empathy not go to the Buddhists of Burma trying to protect their nation? Should the Buddhist nations of the world being forced to swallow the secular pill and drown their Buddhist identity not realize that they need to converge and build a Buddhist League of Nations to create a global voice against the lies being spread. The bias and one-sided nature of news being projected on Burma is such that not a single news coverage has taken the side of the Buddhists of Burma or taken a single effort to balance the story covering the fears of the Buddhists in Burma. It is no different to the world coverage given to the attack on Buddhists in Bangladesh. The Chakmas living in the Chittagong Hill Tracts of Bangladesh were forced to flee their traditional lands due to Islamic persecution and violence in the early 1990s. The Jumma Buddhists suffered the same fate with successive governments settling scores of Muslims in the Chittagong Hill Tract region. The violence by Muslims extremists with the explicit approval of their Western backers upon Buddhists in the Chittagong Hill Tracts number many and cover numerous years . No media covered or cared to cover their story. When Muslims destroyed the Navajyoti Buddhist vihara at Lalyaghona Village breaking down many Buddha images there was not a single global outcry against the violence because it had the tacit approval of the West and its Western media chose to keep silent. Media that is talking about traditional lands have never highlighted the traditional lands that have belonged to Buddhists and have today been either encroached upon or totally lost. Why has the UNHRC not taken up the rights of thousands of Buddhists displaced owing to violence and who need to be resettled? Why has there not been a single global conference or international voice raised on behalf of the Buddhists and the incursions they are suffering? Again the objective of the Western-controlled Islamists under whose influence Muslims of Thailand find themselves are now calling for a separate country for Muslims in Southern Thailand. Mainstream media leave out the attacks by Western-backed Islamic groups upon Buddhist civilians and monks. Muslims that arrived as traders were treated as aliens by colonial rulers and were never treated as indigenous natives. Land ownership to Muslims were given only in 1815 by the British. It is unfortunate that Sri Lanka’s post-independence leaders have fallen prey to carrying the foreign secular crown instead of acknowledge the Buddhist cultural heritage of Sri Lanka and being proud of it and insisting that all natives of Sri Lanka accept the Buddhist identity of Sri Lanka. The Buddhist identity of Sri Lanka is nothing that needs to be debated about or sought permission from the West to adopt. Minorities need to accept the archeological and historical evidence. It is unfortunate too that Sri Lanka’s leaders have fallen prey to dividing the identity of Sri Lanka along 2 languages when a country needs to have only one unifying language and the language spoken by the majority should be the language of that country. It is anyone’s guess why a minority religion should be given official status on par with the language of over 70% of the majority populace? It is the same elsewhere in the world, why should it be any different in Sri Lanka. It is when politicians use historical identities to bargain their existence that Sri Lanka finds itself in the present impasse. Do we have Sinhala Buddhist leaders to highlight the destruction of archeological and historic cultural monuments and remains in areas inhabited by Muslims? Who will tabulate the Muslim encroachment of traditional Sinhala Buddhist temple and, the demolition of historic sites and archeological remains of Buddhist heritage though there are Ministries allocated and Sri Lanka’s Constitution has a separate Article for Buddhism and the State is required to foster and protect Buddhism? Are there leaders in the Government that can argue against the one-sided publicity given about Muslims being attacked so as to project the incursions taking place? Has the Foreign Ministry ever taken an effort to set the story straight? As minorities given the scale of privileges that they enjoy as an ethnic group and through their religions is it fair to disrespect and disregard the rights of the majority Sinhalese Buddhists? Should the majority have to function according to the dictates of the minorities whose faiths are dictated by their agents overseas and most often with the hand of globalist imperialist involvement? If so, do the Sinhalese Buddhists have existential fears themselves given that the caliber of politicians are such that easily fall prey to remunerations of any kind so long as they can enjoy power and privileges? Knowing the globalist involvement in handling Muslim Islamic groups and arming them to do their dirty work, why has the Government not taken action against the rising numbers of madrassas being set up all over the country to brain wash innocent Muslim children? Is it only the ordinary people that see visible changes in Muslims in their attire and behavior that was never prevalent decades ago? Should those professing to be unifying people not question this type of action as self-polarizing Muslims and then complaining they are being treated differently? Should people not point out that Muslims should assimilate and not separate in behavior and action by creating Muslim ghettos and thinking that Islam is one and only ‘chosen religion’ and Muslims are the one and only ‘chosen people’? Should the Government in realizing the dangers of ghettos not take immediate steps to stop such taking place and ensure that even flats given by the state are allocated according to ethnic ratio as is done in Singapore? Is the halal not a business venture created following the same ‘kosher’ blueprint and steered by globalists and bankers making merry by fooling people with labels they know has no meaning in practice? Moreover, in a country where over 74% are Sinhalese can ethnic minorities carry out business only amongst their own without generating business with the Sinhalese? When the US state department has identified 4 Al Qaeda linked Jihad groups in Sri Lanka ” Sri Lanka Jamthi Islam, Thauhid Jamath, Thableeq Jamath, Jamathi Muslim, there is cause for concern because these are all steered by the West. Indonesia was known as Thiri-wizaya nation and was a thriving Buddhist nation in the 7th century AD. Today, it is a country where Muslims are fighting for a separate state. Malaysia’s history dates back to 2000 BC with migrating Mongol Chinese from Yunan Province and built the Malacca City in the kingdom known as Malayu. Malaysia was introduced to Buddhism from Sri Lanka in BC 309 (250 years after Lord Buddha’s death). Malaysia has ample Buddhist sites as evidence of Buddhist heritage. Buddhist Mongol king of Malayu (Malaysia). Buddhism in Malaysia (Malayu) prevailed until the 15th century AD when the sword of Islam brutally changed the status quo. The fear of Buddhists throughout present day Buddhist world has a pattern. The Arab Muslim traders that arrived in Malayu in late 15th century AD started to treat the Buddhist natives with respect and friendship and then they slowly began to convert the ruling class, tapping the vulnerable King and dividing rulers and the people and creating cronies to act on their behalf. That was how the Muslims took over both Indonesia and Malaysia. In ancient times when Muslims conquered land, they killed the men and raped the women and girls and started rapid breeding. In the modern age tactics have changed and proselytizing by warfare is replaced by forcing Muslims to breed. Muslims themselves have no control of the situation. The OIC, the multinationals, the UN are controlled by the same set of people creating disharmony and dividing people throughout the world. What Happened in Malaysia could happen in Burma, Thailand and Sri Lanka too. Once Buddhist nations that covered present day Afghanistan, Pakistan, Iraq, Iran, Syria, Jordan, Indonesia, Malaysia, Bangladesh, Kashmir were all taken over by Muslim aggression. This is ample evidence to showcase existential fears of present day Buddhists in the handful of countries that remain at least Buddhist in name and with Buddhist majority despite politicians compromising with that identity. Existential fears are statistically proven in 80% of Greater Asia once Buddhist has been reduced to shocking numbers with entire countries turned to Islam. Does the world’s public not realize this fear in the remaining Buddhist nations and empathize with the people? Is it the fault of the compassionate Buddhists that they do not fight back with the same aggression they are treated? Have Buddhists in any of the lands Islam took over used a single sword in defense? Did the Buddhist monks in Nalanda and Maldives simply give their heads and allowed the fate to be decided by the sword? Are these crimes never to be taken up and accounted for? If Burma is standing firm is it not because they have seen what happened to Buddhists in neighboring Malaysia and Indonesia, Bangladesh and Maldives? Is there even a mention of Buddhism in their history books today? Has the presence of Buddhism not been expunged for their history officially? Have the Buddhists destroyed a single non-Buddhist religious site as Muslims have done? Are the Burmese not justified to fear that their Great Shwe Dagon Pagoda will end up like Boro Buddha or the fate that fell the Bamiyan Buddhas which had been repeatedly attacked through centuries. Given the manner in which globalists have used Muslims arming them and spurring them to call jihads and separate Islamic states, can Buddhists be blamed for questioning the lack of peace in Muslims? When Buddhists have examples to show of Buddhist lands being taken over by militant Islamic groups, Buddhist sites destroyed and brought to ruins, Buddhist civilians and Buddhist monks massacred and Buddhist history completely subjugated from history books the existential fears of Buddhists is a matter that the world cannot simply ignore or put aside terming Buddhists as being paranoid with unnecessary fear. This is no time for scholarly fellowship on Buddhist theology. The Buddhist leaders, Buddhist thinkers and Buddhists of Thailand, Myanmar, Sri Lanka, Cambodia and Laos need to wake up and realize that there is an identifiable threat to the existence of Buddhism. We have watched the decline of Buddhist lands, Buddhist numbers and it is only a matter of time that these statistics will dwindle further. Are we to simply sit and watch and fall prey to secular identities which are masked with the covert intention of bringing in both Christian and Islamic influencers to dislodge the identities of the Buddhist nations thereby breaking the nationalist thinking embedded in the people. It has become easier to prey upon the minorities promising them lands and autonomy and guile them into playing a role in the devious plans being forged. In Sri Lanka’s case where the presence of both Christian and Islam external influences are equally strong it is a case of Sri Lanka one day turning into a South Korea or Maldives. It is no better a time than now for the political leadership to ask themselves this key question and place their role in the predicament and if the Buddhist identity of Sri Lanka means as much as it does to the Buddhist world something needs to be done sooner than later. Top on that list is the need to identify the areas of concern which are religious conversions, mainstream mass media which places Buddhists on the dock making them feel guilty without highlighting the grievances and wrongs happening to Buddhists, the lack of reciprocity by nations that continue to deny Buddhism as an official religion, the use of ‘secularism’ at every given opportunity to deny identifying with the ethos of the country, while Britain with hardly 50% of Christians refer to itself as a Christian state while asking other countries to follow secularism! With the Asian Giant awaking, China ready to take on a larger cultural role and spearheading a revival of Buddhism it is no better a time to return to the traditional values embedded in the cultures of the East when visible the cultures and values of the West are falling apart before our very eyes and Westerners themselves are turning to eastern dharmic religions for salvation and in search of the truth. While understanding that the crisis facing the Buddhist world can be averted through an effective mechanism to save Buddhist nations in danger it is for the Buddhists, the Buddhist organizations, the Buddhist leaders to create a bloc, set up a communication media and carry the message of the Buddhists in a world which has been only projecting versions with agendas. Kra-Isthmus Canal can change the fortunes of Thailand, Myanmar and Sri Lanka. Without economic clout these nations cannot sustain their identities. ‘Divide & Rule’ > Resource grab ! Buddhism that was once a predominant religion in countries as far as Afghanistan, Maldives, India, Indonesia have completely disappeared due to relentless attacks by Islamic forces and the pacifist nature of Buddhism. As in the case of Nalanda, a Buddhist university in India which was attacked and destroyed by Turkish Muslim invaders under Bakhtiyar Khalji. Instead of taking arms or conversion to Islam, the Buddhist opted to be slain by the invaders. Let history not repeat itself again. It is time for predominantly Buddhist nations (starting with Sri Lanka, Thailand, Cambodia, Laos, Myanmar, Bhutan, and Mongolia) to form an international organization such as ORGANIZATION OF BUDDHIST NATIONS (OBN) not only to counter the threat from Muslim fundamentalism and other forms of terrorism but also to have a united voice in world affairs. unpatriotic politicians bend over backwards to help them to stay in power. Vinasha Party (JVP), Gonseka etc. etc divide the Sinhalese. What more you can ask for? within few hundred years of their arrival. Baby machines go into overdrive. land. What a spineless, greedy lot we have voted in to destroy the nation. Complaining against their breeding programs is not enough. Something must be done. Israel practices various tactics to limit their breeding. We have to copy them. These tactics DON’T need their consent! Violent, unjustified, criminal methods are not the answers in Sri Lanka calls herself “Buddhists”. Within the question ,”Sri Lanka, Thailand, Mynmar in the firing line. Where are all the Sinhalese politicians? ” lies the answer. Diligence is the answer. We won the war by fighting diligently with minimum injustice and criminality. We did not deploy suicide attacks or killed others to set up one against another – it was a clean war. When it comes to politics, it is completely rubbish but the politicians with Zero discipline took the credit. We have Ponnasekas running the country, no one wants to give up wealth and greed to the benefit of the masses. After that HINDUSTAN decided to reestablish the university BUT NOT for Buddhists. For all, MOSTLY for the HINDU majority. So there is a pattern. One attacks, the other harvests. Or the other one attacks and the first one harvests. Or a third one attacks and the other one harvests. they have more right to be there than Sinhalese want a separate country. Ideal environment for mossies to outbreed and outnumber. have no spine to do anything as they rely on the mossies’ votes. Why everyone saying (inc. Shenali), Buddhist Malaysia became mossie by conversion. It is no conversion. It is outbreed and outnumbering. Sinhalese couple have 2 children. Mossie couple have up to 10 children. while mossie 10 couples will make 100. A LEGAL method will NOT work as you can see in SL. Law ALWAYS bends to please minorities. What we need is a way to make Mossies infertile without them knowing it. Israel uses these methods. Adding certain preservatives to halal beef and imported dates is one way. Mossies use this tactic against others in SL using lozenges coated in poison. BBS exposed this crime. Lorenzo, very good idea. Our spineless politicians won’t do anything like that. 8 marrying Sinhalese and Tamil girls. BBS should contest for the presidency. Then the government will listen. the mossies destroy both Sinhalese and the Tamils. This entry was posted on Thursday, April 24th, 2014. You can follow any responses to this entry through the RSS 2.0 feed. You can skip to the end and leave a response.